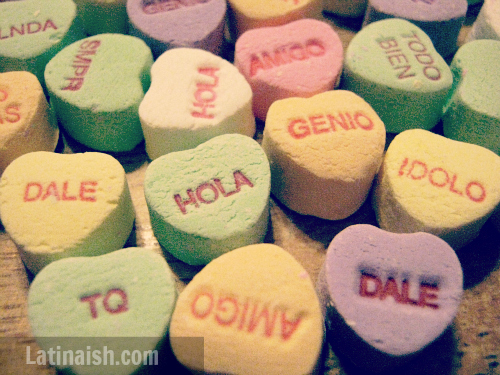 Over the weekend I shared on Facebook that I discovered these Spanish-language Conversation Hearts at Target and I asked if I should give away a bag here on Latinaish. As expected, the answer was an overwhelming “¡Claro que sí!” so here is your chance to win a bag of Spanish candy hearts for Valentine’s Day! See the rules (below) for how to enter. Prize description: One lucky winner will receive a 1 lb. 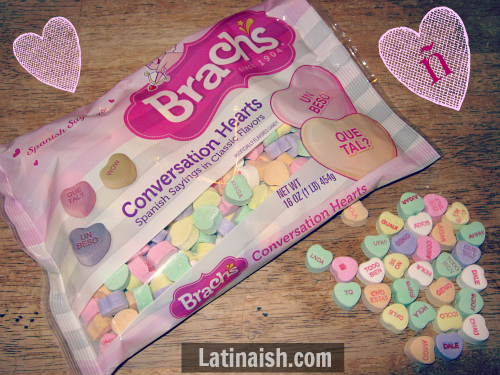 bag of Brach’s Spanish Sayings Conversation Hearts in Classic Flavors. Official Rules: No purchase necessary. You must be 18 years of age or older to enter. You must be able to provide a U.S. address for prize shipment. Your name and address will not be shared with any third parties. This prize was purchased by Latinaish.com and will be shipped by Latinaish.com. Please no P.O. Boxes. One entry per household. Make sure that you enter a valid E-mail address in the E-mail address field so you can be contacted if you win. Winner will be selected at random. Winner has 48 hours to respond. If the winner does not respond within 48 hours, a new winner will be selected at random. Giveaway entries are being accepted between February 4th, 2013 through February 7th, 2013. Entries received after February 7th, 2013 at 11:59 pm EST, will not be considered. I will try to have the prize shipped so it arrives before Valentine’s Day but I do not make any guarantees that it will arrive on time. The number of eligible entries received determines the odds of winning. If you win, by accepting the prize, you are agreeing that Latinaish.com assumes no liability for damages of any kind. By entering your name below you are agreeing to these Official Rules. Void where prohibited by law. Disclosure: This is not a paid or sponsored post. Brach’s was not contacted by Latinaish.com and Brach’s does not necessarily endorse Latinaish.com. All opinions are my own. I’d want my hearts to say Te Amo and I’d share share them with my son and husband. I know its not an actual word, but it conveys love for someone who loves themselves first. Besame! I tell my love that all the time :) He loves my demands. I should win because I am a Spanish teacher and need any incentive I can get my hands on to teach my kids! I would want my heart to say “Guiño” because I always say, “wink”, as a flirting method!….but not to my students. Just to clarify. I want my heart to say “PR mama.” Mi hombre es americano and he calls me that all the time. Todo tuyo, Yes, that is what I want mine to say. If I do not win I will be buying those for my students, kids like sweet incentives and better yet left overs for my gringo. I would like the heart to say Mi Amigo. If someone gave me the candy. Mi corazon- (wth an accent over the last o) What else?